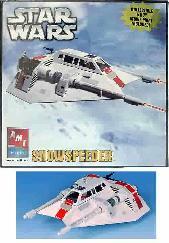 Item #38498B Epidsode III-Obi-Wan-Kenobi Diecast Jedi Starfighter Model Kit $15.95 ea. In Stock This new Amt/Ertl Star Wars Episode III-Return of the Sith, diecast Obi-Wan-Kenobi Jedi Starfighter, is still sealed,all metal parts, pre-painted even comes with a screwdriver,very detailed,skill level 2. 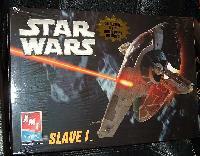 Item #38306 Boba Fett`s Slave 1 Ship Model Kit $24.95 ea. In Stock (HAS BEEN DISCONTINUED BY AMT/ERTL) This Amt/Ertl re-issue Boba Fett`s Slave 1 model kits are still sealed,as seen in Empire Strikes Back,Return of the Jedi,skill level 2,also comes with a 5" X 7" movie print,paint & glue Not included. 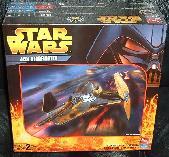 Item #38314 Episode III-Jedi Starfighter Model Kit $14.95 ea. In Stock This new Amt/Ertl Star Wars Episode III-Return of the Sith- Jedi Starfighter model kit is still sealed,skill level 2,very detailed,paint & glue Not included. 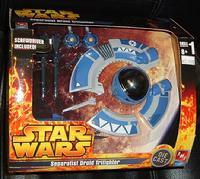 Item #38362 Episode III-Die-Cast Separatist Droid Trifighter Model Kit $13.95 ea. This new Amt/Ertl Diecast Episode III Droid Trifighter model kit is a skill level 1, still sealed,pre-painted comes with a screwdriver,very detailed another great model for a begennier, paint & glue Not included or needed. Item #38272 Rebel Alliance Snow Speeder Model Kit $17.95 In Stock (ONLY HAVE 1) This new Amt/Ertl re-issue Snow Speeder model kit is a skill level 2, still sealed, as seen in Empire Strikes Back fighting the AT-AT Walkers on Hoth, includes 2 Rebel pilots, cockpit opens,also comes with a collectible 5" X 7" movie print, paint & glue Not included. 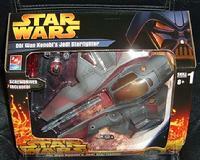 Item #38361 Die-Cast Episode III-Anakin Skywalker`s Jedi Starfighter Model Kit $13.95 ea. In Stock This new model kit from Star Wars Episode III is a die-cast kit,still sealed,skill level 1 pre-painted, comes with a screwdriver this kit is great for a person just starting out building model kits,paint & glue Not included or needed.